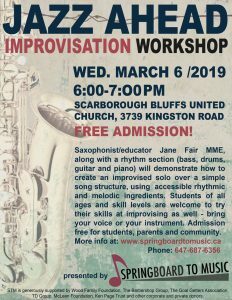 Saxophonist/educator Jane Fair MME, along with a rhythm section ( bass, drums and piano) will demonstrate how one song can provide the ingredients for each participant to create an improvised solo, using simple and accessible rhythmic and melodic ingredients. Students are welcome to try their skills at improvising as well. Bring your voice and your instrument – all welcome!